One of the more common reasons for giving up an exercise routine is excessive pain caused by working out. What’s sad about this is that a lot of workout pain may be prevented by a good pair of exercise shoes. If you’re starting a workout routine, you should invest in a quality pair of shoes. Good shoes will support your feet and align your body correctly; you’ll feel less pain in your legs, back, and, of course, your feet. Here are some tips for finding the right shoe to fit your feet and your needs. If you want to use your shoes for a specific activity, i.e. tennis, running, etc., get a shoe designed for that specific sport. It’s going to provide better support and flexibility in the areas specific to the movement you’ll be doing. For instance, tennis shoes provide better side to side support while running shoes provide more front and back support. You’ll also find a difference in flexibility between certain types of shoes. Go shoe shopping at the end of the day. Pressure on your feet during the day makes them swell. If you buy shoes in the morning, you may find your snug shoes are now just too tight. You should also be sure to wear the same socks you exercise in; otherwise you’ll run into the same problem. Leave a little extra space in your shoes. If there is a thumb’s length between your longest toe and the end of your shoe, you’ll experience less pain from crunched toes. Be sure the shoes don’t slide forward and backward when you move. Find a shoe that fits the shape of your foot. A shoe with proper support should feel snug all over. This means the insole is absorbing the pressure, not your foot. If you can’t find a shoe with enough support, get orthotic inserts. This is especially important if you already experience foot pain. For severe foot pain, you should be fitted for a customized orthotic by your doctor. Find a shoe that fits how you run. This is actually usually determined by the shape of your feet; specifically how high your arches are. Overpronators’ feet roll inward as they run. They often have flat feet and should buy shoes marked for stability or motion control. Supinators’ feet roll outwards as they run. The usually have high arches and should look for shoes marked as flexible or cushioned. If you have normal feel that don’t roll when you run, you can buy a variety of shoes. Consider where your shoes will be used. If you’re running through the woods, you’ll require a different amount of traction than if you’re playing tennis or volleyball on a court. Be sure to check the tread and see if it is appropriate for your needs. Try the shoes out. Don’t just put them on while sitting and then take them back off. 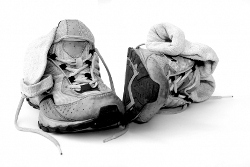 Lace up the shoes and move around as if you were performing your exercise. Good shoes will feel comfortable as soon as you put them on. If you follow these simple rules, you’ll be sure to find the perfect pair of shoes for you.